Implementing a planning process with strong M&O components can best be accomplished by a new approach to transportation planning for operations, one that is objectives-driven rather than project-driven. An objectives-driven, performance-based approach focuses on both short-term and long-term system performance, using established system performance measures rather than simply focusing on implementation of projects as a measure of success. The maxim that "what gets measured gets managed" recognizes that performance measurement can focus the attention of decisionmakers, practitioners, and the public on important characteristics of the transportation system. Similarly, using the approach in the MTP will place increased attention on the operational performance of the transportation system. By including operations objectives that address system performance issues, such as recurring and non-recurring congestion, emergency response times, connectivity among modes, and access to traveler information, the MTP will yield programs and strategies that more effectively address these concerns. In addition to addressing long-range system capacity needs, the MTP will encourage operators to play a more important role in transportation investment planning and address both short-range and long-range needs. A more objective approach to addressing operations in the transportation planning process. By using the approach in the MTP, resource and investment decisions can be made with a clearer focus on outcomes of the plan. This will allow a better screening of strategies using objective criteria. While political considerations, public support, and tradeoffs between different goals will continue to play an important role in the process, having a clear set of agreed-upon objectives in the MTP will allow comparisons of alternative strategies and scenarios using specific metrics. Focused transportation investment prioritization. Use of operations objectives and performance measures in the MTP will help in prioritizing investments on a regional basis. With regional operations objectives, there are established metrics for determining which investments are most important and cost-effective in meeting regional goals. For instance, regional operations objectives naturally lead to the development of performance measures, which can be utilized as part of the CMP to prioritize locations with the most significant recurring and non-recurring congestion problems. Improved resource allocation. Transportation investment decisionmaking will become more comprehensive, incorporating system operations for an optimal mix of operations and capital projects and programs. In addition to "stand alone" operations projects, M&O strategies can be built into transportation system preservation, capacity expansion, and safety projects to help maintain existing and future planned capacity and safety. Increased accountability and measurement of performance. Success in achieving regional operations objectives can be tracked over time. Tracking performance can help transportation agencies demonstrate to the public the benefits of their programs and investments and can feed into future updates to the MTP if it is determined that objectives need to be reassessed. Engaging the operations community in a substantive way. Integrating M&O into the MTP process has benefits for transportation planners and operators as well as the traveling public. By working toward optimizing the transportation system with M&O strategies, planners are better able to demonstrate to the public and elected officials that progress is being made on reducing congestion in the short-term with lower cost techniques. Similarly, managers of day-to-day system operations are able to make their limited staff time and other resources go farther by collaborating with planners and other operators to address operations from a regional perspective. Transportation operations improvements made in one jurisdiction are reinforced by coordinated improvements in neighboring areas, enabling travelers to move seamlessly across the region without encountering inconsistent traveler information, toll collection technologies, or traffic signal timing. By working together to address transportation issues of regional significance with M&O strategies, planners and operators are able to have a greater impact on the performance of the transportation system in the region than they would by working alone. The MTP and TIP will result in a more optimal mix of transportation investments among system preservation, M&O, safety projects, and system expansion strategies, and will more effectively integrate M&O strategies into all types of investments. The ultimate benefit of the approach is the improvement in regional transportation system performance that is realized when jurisdictions and agencies work together toward commonly held operations objectives. The use of an objectives-driven, performance-based approach for integrating operations into the MTP has multiple benefits for operating agencies that participate in the approach. The approach is intended to be conducted as a collaborative effort between planners at the MPO and operators in the region. Through the use of the approach, operators have an established, formal mechanism for elevating their needs and interests in the development of the operations objectives. By working to incorporate operations into the plan, operations needs and the benefits of M&O strategies receive more attention and perhaps more funding on a regional level. This approach also helps to create greater awareness among operating agencies of data or other technical resources available from the MPO. The approach helps to advance and strengthen the collaboration among operators, and in turn, the collaboration brings tangible benefits to the participating agencies working toward the operations objectives. Collaborating agencies can benefit through acquiring and applying resources more efficiently: sharing critical skills, negotiating favorable terms in joint purchasing decisions, sharing facilities, developing standards for materials and supplies that allow resource sharing, etc. They can also establish common procedures and practices and share information so that they perform key functions more effectively and in ways that are seamless from the perspective of system users. Through collaboration, agencies can reduce duplication in service or combine project needs and submit a joint application for funding. An objectives-driven, performance-based approach for improving operations is well-supported in practice in self-sustaining private and public organizations that are responsible for generating sufficient revenue to meet cost and/or produce profit through delivery of services in a competitive or service-driven context. For example, package delivery companies such as FedEx collect data, monitor key performance measures, and make adjustments on a daily basis. This focus on performance targets and measures has contributed to increased service quality and customer satisfaction. The Electric Service Delivery business area of Austin Energy developed a set of key performance indicators aligned with the organization-wide objectives. The performance indicators are divided into three tiers: strategic, operational, and support. The strategic, operational, and support key performance indicators are used by executives, managers, and supervisors of day-to-day operations respectively to manage and improve quality. The first-tier performance measures are reported regularly to the community as part of the overall organization's performance measures through the Austin Energy website, bulletin boards, and newsletter. The Austin Energy Electric Service Delivery business area management meets every 6 months to evaluate the effectiveness of the quality management system. Several benefits have been realized by the Electric Service Delivery area because of its quality improvement effort including improvements in: communications and collaboration between operational work groups, the documentation of issues as they occur, identification of root causes, and action plans developed and carried out to address these issues. Similarly, the Illinois Tollway has worked to measure, monitor, and improve its performance.11 The Tollway focuses its efforts on four key operations areas: overall traffic operations, toll collection, incident response, and construction work zone management. It operates 286 miles of highway and serves approximately 1.4 million customers a day. Since the early 2000s, the Tollway's management has focused on measuring how the system is operating and performing (e.g., where it is experiencing backups, where it typically has slow downs, and what the travel times are). Performance measures include traffic volume, speed, travel time, and length of backup. Key performance measures for incident response include detection, response, and clearance times. The Tollway also audits and monitors tow activity to manage the towers' operations closely. The Tollway's management produces quarterly reports for the Governor's office regarding non-recurrent congestion. These reports provide timely, measurable results regarding overall improvements based on the performance measures in place. 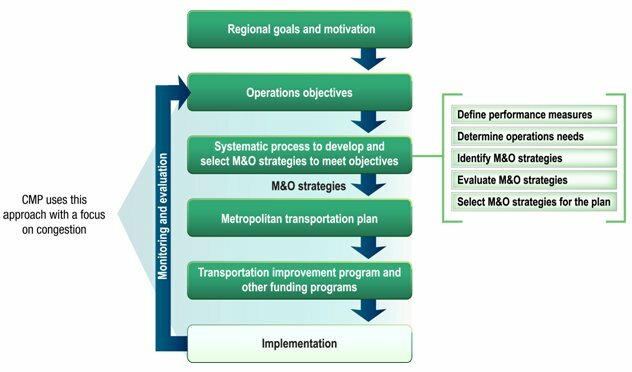 Additional details and potential lessons from the use of operations objectives and performance measures in financially self-sustaining public and private organizations can be found in Appendix D.
An objectives-driven, performance-based approach to planning for operations involves the development of operations objectives for a region, which inform the way in which transportation investments are determined as part of the MTP, as shown in Figure 4. This approach can be used to address a full range of operations issues, such as traffic congestion, transit operations, emergency response, and integration of transportation services, among others. In areas subject to the Federal requirement, the CMP encompasses this approach with a focus on congestion. The development of a regional vision and goals arises from a thoughtful and deliberate regional process that takes into account the eight planning factors. The regional vision and goals are the agreed-upon statements of the overall aims of the regional transportation plan and define the desired end-state. Operations objectives in the MTP flow directly from the goals. These objectives are measurable and define desired outcomes that help to achieve the goals. Operations objectives are defined for a region rather than a single jurisdiction and often include multiple modes. They are developed through coordination and collaboration with operating agencies and play a central role in the planning process. In the congestion management process, objectives specific to congestion management would be developed. The operations objectives lead to a systematic process to develop and select M&O strategies to meet objectives. In this process, performance measures are defined that will be used to assess current operational performance needs, progress toward the operations objectives, and the effectiveness of M&O strategies. Identifying the operational performance issues in the region that must be addressed to reach the region's objectives is a crucial element in planning for operations improvements. This involves examining current system performance and operations practices to answer the question of what needs to change to reach the objectives. This step typically requires collecting data and determining the cause and extent of system performance issues. During this process, operations objectives and associated performance measures may be tailored to regional needs, availability of data, opportunities for coordination and collaboration, and existing performance measures used by agencies in the region. Next, M&O strategies are identified to meet regional operations objectives. This is best accomplished through collaboration between planners and operators. Planners may often be able to supply data on where current and future mobility issues will arise, and operators can give input on the operations strategies that they think would be best to implement. M&O strategies involve a variety of activities including expanding current operations services such as freeway service patrols, adopting a best practice from another region, developing mutual aid agreements, or implementing a new system such as a common video-sharing system between traffic management centers (TMC). Once M&O strategies are identified and proposed, the next step is typically to evaluate the effectiveness of these strategies in addressing the regional need. There are several analysis tools available for use in evaluating the effectiveness of operational improvements. M&O strategies are then selected within fiscal constraints for inclusion in the MTP. In the context of the CMP, the systematic process described above is focused on objectives for managing congestion rather than a broader set of operations objectives. Additionally, the systematic process as performed in the CMP leads to the consideration of M&O strategies as well as other types of strategies, such as growth management or increasing system capacity, that address congestion. The CMP includes establishment of a coordinated program for data collection and system performance monitoring, identification and evaluation of the expected benefits of appropriate congestion management strategies, and development of an implementation schedule and possible funding sources for each strategy. The result of this approach is an MTP with a 20+ year outlook that includes operations objectives, performance measures, and a mix of M&O strategies and capital investments. Additionally, the TIP with a near-term focus includes specific M&O programs and projects arising from the plan. Planned and programmed investments are then implemented. Contribute to decisions at the MPO and State level regarding investment priorities, land use, and economic development. Participate in developing regional operations objectives. Provide operations data to planning partners. Recommend transit-based strategies for improving regional transportation system performance. Implement performance-based objectives in planning processes. Collaborate with other transportation operators in regional operations efforts. Monitoring and evaluation of the transportation system then feeds back into the update of the regional vision, goals, and objectives in the next cycle of developing the MTP. The CMP includes methods to monitor and evaluate the performance of the multimodal transportation system and a process for periodic assessment of the effectiveness of implemented strategies. "(a) The transportation planning process in a TMA shall address congestion management through a process that provides for safe and effective integrated management and operation of the multimodal transportation system, based on a cooperatively developed and implemented metropolitan-wide strategy, of new and existing transportation facilities eligible for funding under title 23 U.S.C. and title 49 U.S.C. Chapter 53 through the use of travel demand reduction and operational management strategies." "(b) The development of a congestion management process should result in multimodal system performance measures and strategies that can be reflected in the metropolitan transportation plan and the TIP. The level of system performance deemed acceptable by State and local transportation officials may vary by type of transportation facility, geographic location (metropolitan area or subarea), and/or time of day. In addition, consideration should be given to strategies that manage demand, reduce single occupant vehicle (SOV) travel, and improve transportation system management and operations. Where the addition of general purpose lanes is determined to be an appropriate congestion management strategy, explicit consideration is to be given to the incorporation of appropriate features into the SOV project to facilitate future demand management strategies and operational improvements that will maintain the functional integrity and safety of those lanes." Definition of objectives for congestion management. Definition of appropriate performance measures to assess the extent of congestion and support the evaluation of the effectiveness of congestion reduction and mobility enhancement strategies. Methods to monitor and evaluate the performance of the multimodal transportation system, including a coordinated program for data collection and system performance monitoring to define the extent and duration of congestion and contribute to identifying the causes of congestion. Identification and evaluation of the anticipated performance and expected benefits of appropriate congestion management strategies that will contribute to the more effective use and improved safety of existing and future transportation systems based on the established performance measures. Identification of an implementation schedule, implementation responsibilities, and possible funding sources for each strategy (or combination of strategies) proposed for implementation. Implementation of a process for periodic assessment of the effectiveness of implemented strategies in terms of the area's established performance measures. 8 Morris, D.D. and R.J. Baker, "Measuring what matters: [want to know how successful your firm is? Take the customer's point of view]," August 2003. Available at: http://findarticles.com/p/articles/mi_m0ICC/is_2_72/ai_107755417, last accessed July 9, 2009. 9 Telephone Interview with Mercedes Sanchez, Austin Energy. December 3, 2009. 10 Austin Energy, Strategic Plan Update, 2008. Available at: http://www.austinenergy.com/About%20Us/Newsroom/Strategic%20Plan/strategicPlanningUpdate_2008.pdf, last accessed December 31, 2009. 11 Telephone Interview with John L. Benda, General Manager of Maintenance & Traffic, Illinois Tollway. March 2009. 12 Federal Register: February 14, 2007 (Volume 72, Number 30), "Statewide Transportation Planning; Metropolitan Transportation Planning; Final Rule." Available at: http://edocket.access.gpo.gov/2007/07-493.htm, last accessed December 6, 2009. 13 Adapted from the "Statewide Transportation Planning; Metropolitan Transportation Planning; Final Rule" (23 CFR Part 450, Sec 320). See Appendix A for complete language.